Mindful of some people's need for a more portable TBH design, that can be used as a bait hive, pollination, temporary accommodation for a swarm, or supered for honey production, I built this one today. 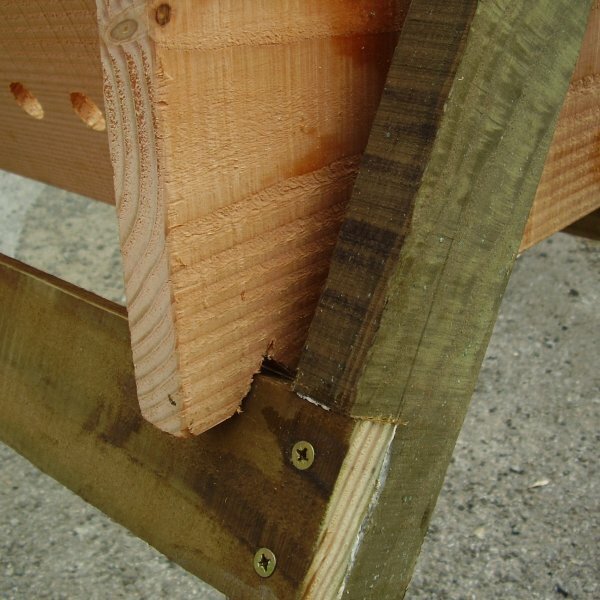 Detail showing the notch cut into the TBH ends to sit on the A-frame crossbars for stability. Showing the A-frame folded for transport or storage. I've been thinking about making one of these, for easy transfer to a tbh with the same height/width dimensions. The principle is simple enough. I like what you did with the folding A-frame. That saves having to look for something to set the box on, where ever you are at the time. And, that is a fine-looking boxer dog!! I really like the folding A frame support. Does it have a geometric lock to stop it splaying apart. I know the notches would prevent this but setting up it could be helpfull. A full length one is doable too. I also like the fact that a closing flap can be installed with this configuration. 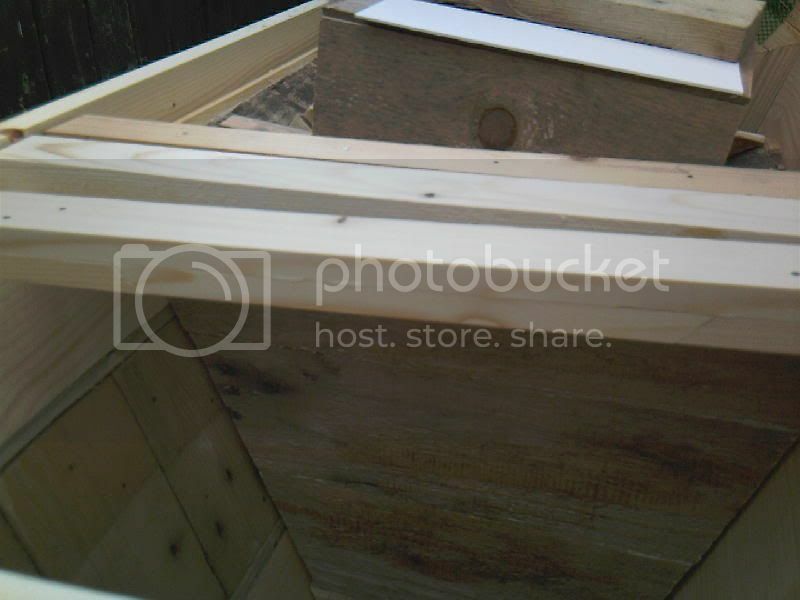 These would make great nucs for an operation like Sam Comfort's Anarchy Apiaries. Now, if somebody could invent a variable-length top bar. Maybe something hollow with retractible extensions at both ends. Or removeable sections like a fishing pole. Nic, born in the Netherlands, living in the UK, Devon, my written skils are disabled by my dislexia. WHO DOESN'T KNOW HISTORY WILL REPEAT IT. I really like the folding A frame support. Does it have a geometric lock to stop it splaying apart. I know the notches would prevent this but setting up it could be helpfull. By tightening the bolts so there is a degree of friction, you can adjust the angle to suit and I don't think a lock would be necessary, although it would be easy enough to fit a chain to stop it at the right setting. A full length one is doable too. I also like the fact that a closing flap can be installed with this configuration. Indeed - in fact I have put a hinged bottom on this one. That A-frame is brilliant! Solves several problems in one simple solution. Great Phil, a Mini Me hive. Very nice Phil, but I want to know more about your helper. I might have known. His name is Reggie, and he lives on the farm where I have my workshop. Stupid, but friendly and playful - typical Boxer! 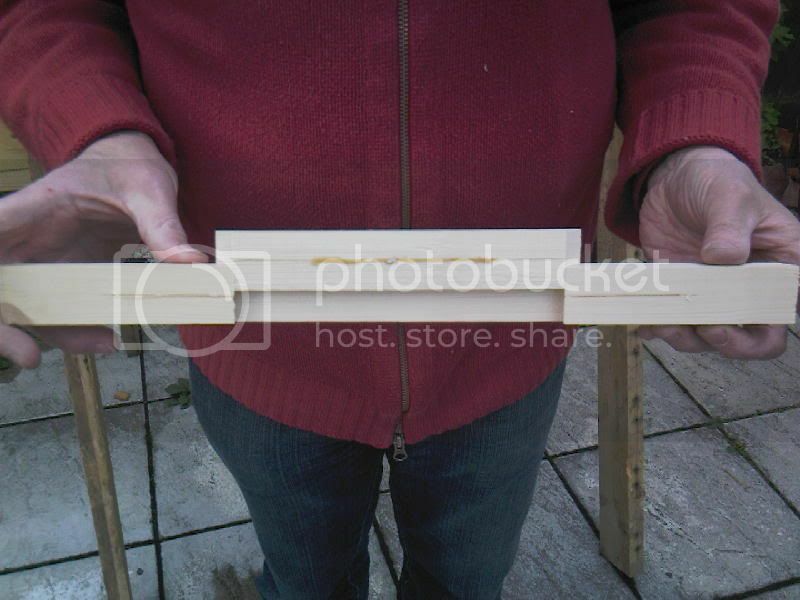 Great idea for portable (bait) hive...which brings me to my question. I hope this is not too obvious or dumb of a question (I'm new at this). I would like to set out a bait hive (or 2) to try to catch a swarm this season. Are there any "rules" regarding placement of bait hives? Since bees will forage for miles won't I just be 'catching' my own bees? I am installing 2 new packages this spring and wonder if putting out a bait hive will 'encourage' bees within those hives to abscond/swarm if the bait hive is too close. Also, recommendations for what to start with to get bees to it? Thank you all for the great info you regularily post; I tried searching on 'bait hive' but many of the links are broken. First, sorry about the broken links. Our server apparently threw a fit and screwed the database up - nothing I can do about it, I'm afraid. First - forget 'rules' - there are only guidelines. If bees followed rules, we probably wouldn't need this forum! - Bees swarm when they are ready, and when they decide to go, the only thing on their collective mind is to find the best new home available within reasonable flying distance. - They typically stay within a couple of miles of their original home, as long as they judge that there will be plenty of forage. We may imagine that this is a survival instinct: move far enough away to prevent undue competition, but not so far as to risk travelling into unknown territory with a significantly different climate or flora. - They have certain preferences regarding a new home: size and possibly shape come into it; probably defensability does (entrance size); location and elevation (safety from predators) is probably taken account of too. It probably helps if the chosen cavity smells right, too, and doesn't heat up too much in the sun. So the more boxes your bait hive can tick, the more likely they will move in. is likely to be successful. If in doubt, think like a bee! I love this. compact and movable. Great! The wax part seems simple enough. Just put in some old comb right? What about the propolis smell? Do you buy the small bottles of propolis and put a few drops inside or something? Yes - or melt down some old comb, which contains both wax and propolis, and cast it into a kind of fat crayon. Just rub it on the inside of the hive! Perhaps rub a little lemongrass oil around the entrance, and inside the hive. Lovely wee hive, biobee. 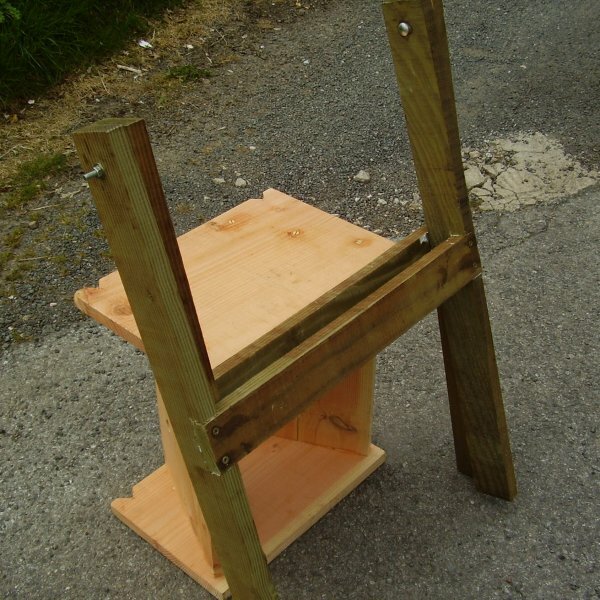 I have something similar, just finished it today (without the swanky folding legs). Perhaps I will put my miniswarm in it. 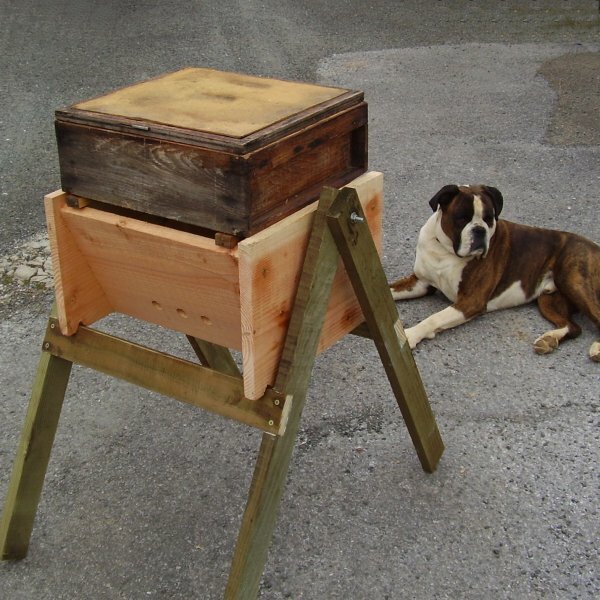 I think your mini-hive is terrific - can you explain what you mean by a "simple telescoping ply box" lid? 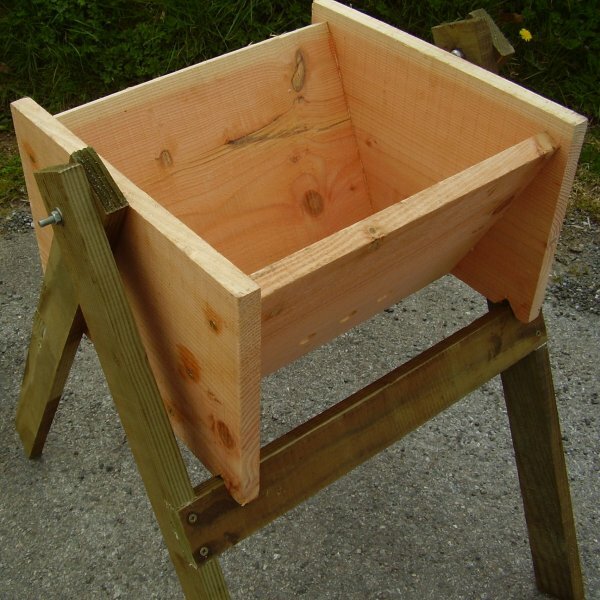 How would it differ from the lid in your full scale hive plan? I mean that it has tall sides, so it slides up to accommodate a super, while still having an overlap on the main hive box. At the moment, two of the small hives that are sited have flat sheets of ply and the other has an old WBC lid, as I haven't had time to build proper roofs yet. - one entrance open with nasanov file hanging from bar inside. I understand that if my new bees swarm they won't use this because it's too close. If I should be so lucky as to catch some strangers, does that matter? Strangers will also be less likely to settle close to an existing hive. A (relatively) remote location would be more likely to catch swarms -- both your own and strangers. Bother! - that's scotched my plan to have them orient themselves in the little hive before moving them down to part of the big empty one beneath. Roughly, how remote would "relatively remote" be? Relatively.... for a bait hive, I think about 25 meters, or on the other side of a structure that gives them a feeling of separation (such as a hedgerow or a shed). I'm not the most experienced one here to give that advice. I'd like to read what others say. Once they've taken a bait hive, the next problem would be moving them without confusing them. Another problem all together. So for now, and information for others, my thoughts are running on my front garden (yard) which is about 1/2 tennis court size. It's surrounded on 3 side by high (8 feet) x 4+ foot thick hedges, with my bungalow on the 4th. The main entrance drive is on the other side of one of these hedges - hence this garden provides reasonable protection from the road (suburban) and pathway on the other side of the fronting hedge. I guess the next step involves fun and games with removals vehicles - unless, perhaps, I do it in Winter? One more detail I forgot -- not on placement so much as position. Bees don't like wind. So if the place you might put a bait hive is in a windy location, place the hive with its back to the wind (or with its back to the most common wind direction if the wind tends to shift a lot). Awesone idea. You could put the baby bars in a bait hive or a narrow nuc and transfer them to the mama hive without cutting the comb. Brilliant. Looks like you could also put them about halfway down in a Kenyan hTBH resting on the slanted sides - built-in super. 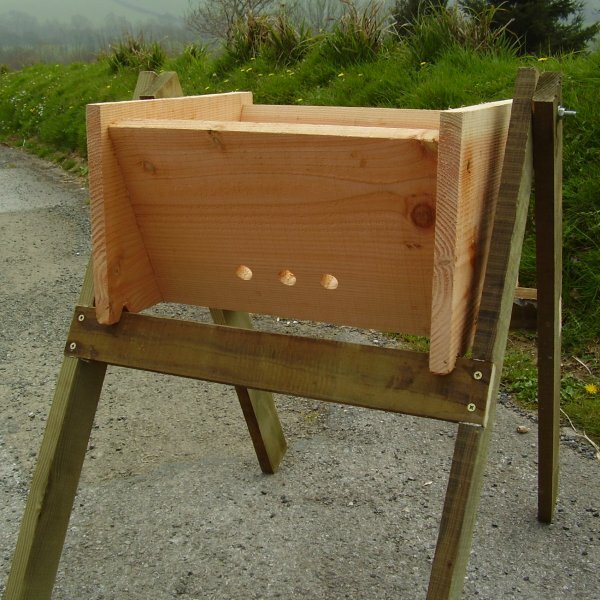 Leave the brood below on baby bars and move the stores above into the mama bars for wintering. 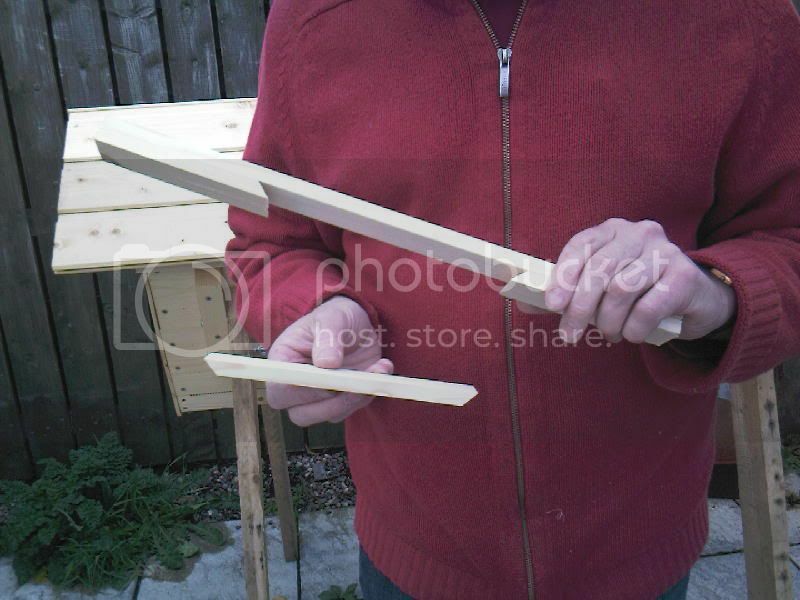 I have built a portable tbh with super as per phils design and established a swarm that came from my htbh, they are building comb in the bottom half of the hive, my question is when should I allow the bees to enter the super? Should I have allowed them access at the start or should I wait until they have filled the bottom half of the hive with comb.